"Do you guys want pancakes for breakfast?" That's how these pancakes came to be on a cloudy Saturday morning. 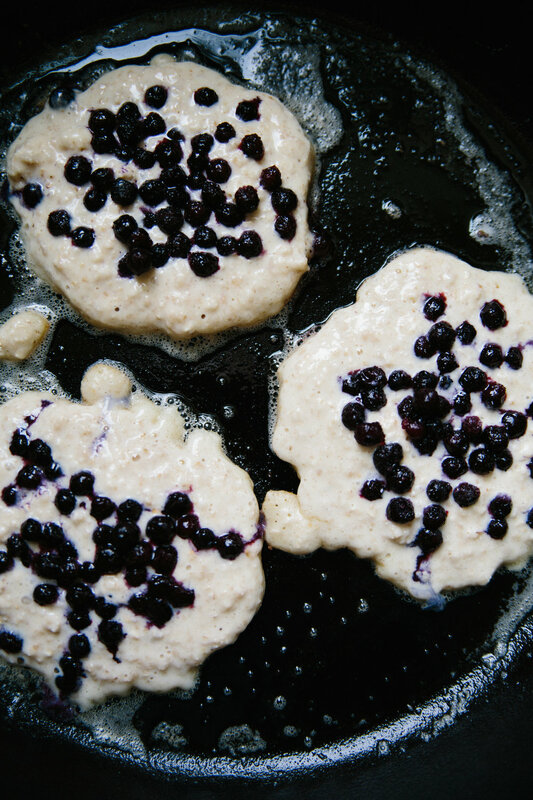 I took one of our all-time favorite pancakes (oatmeal) and sprinkled little blueberries onto each one as they cooked. They were exactly what we wanted to eat. Hola. I'm emerging from an unintentional 8 month blogging hiatus to bring you a current favorite recipe for scones! We could all use more scones in our lives, right? I'm a huge fan of them- not the dry and crumbly kind, but the tender and slightly flaky variety. These are those. Say hello to my current favorite recipe (and the first new recipe on this site)! It does a good job epitomizing the sort of recipes I'm into lately with all of these schedule changes; short ingredient lists and quick assembly are where it's at, folks.